which was printed in London in 1638. 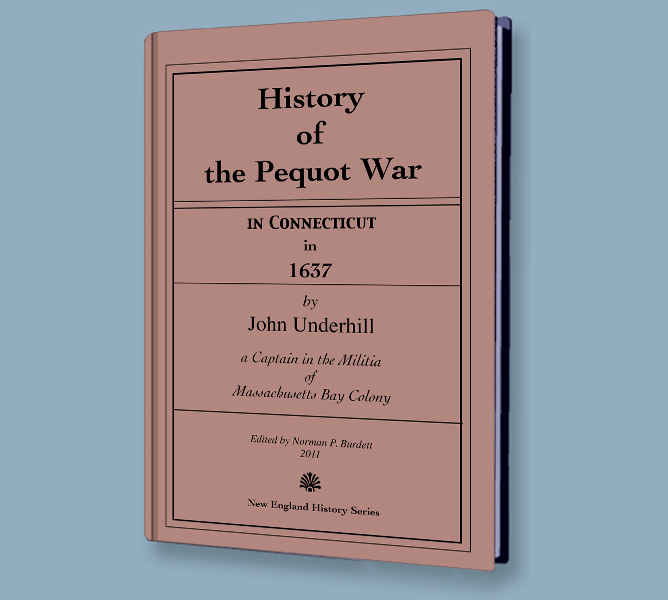 John Underhill´s account of the brief war with the Pequots is a valuable one, for many reasons. He was at the famous fight at the Pequot Fort at Mystic and gives firsthand information; but he also provides information about the attack on Block Island, which is hard to come by, and he gives details about the behavior of the Narragansetts and the Mohegans who served as allies to the colonies and helped to bring about the downfall of their hated enemies, the Pequots. My purpose in developing this edition was to make this material accessible to the general reader. The spelling and the vocabulary of the 1600s can discourage a casual reader from reading it through. It is my belief that more people would find the information interesting if it were not so difficult to read. What I have done is modernized the spelling and changed archaic forms of common words into current usage. I have not changed the meanings at all, so the story you read is the same one that John Underhill wrote in 1638. You will still get the flavor of the times and the quaint manner of his speech. I have also tried to anticipate words that are unfamiliar to most of us today and to provide meanings for them, either in brackets [like this] or with explanations in the form of footnotes. The book shows how the colonists had grown from a sickly handful of starving immigrants in 1620, to be able to devastate what had been the most warlike tribe in the area by 1637.